Preview: Picture books all with a fun cookie theme! A brief description of each one is included. What's your favorite cookie book? C is for cookie! 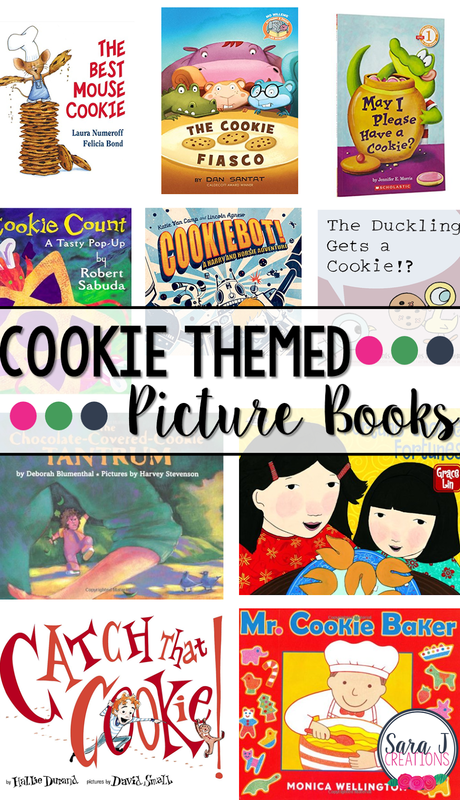 After all of our Letter C Activity fun from last week, we decided to round up some of our favorite cookie themed picture books. There are so many cute cookie books out there. Here are 10 of our favorites! This is a sweet story that follows the process of baking cookies. This would be a great book if you are studying the "how to" genre. There are even recipes in the back of the book to make your own cookies. Harry and Horsie are hungry and decide to make a robot that can reach the cookies that are out of reach. But it takes a bad turn when the robot starts terrorizing the town in search of more cookies. Harry and Horsie have to save the day! Sophie sees another girl at the park with a cookie and she wants one too. She throws a HUGE tantrum when her mom won't give her what she wants. She finally calms down. eats all of her dinner and is rewarded with a cookie. My 5 year old was confused about why she got the cookie because she was throwing a tantrum so she shouldn't get one for that kind of behavior. Lol! I reminded her that she got it because she took a nap and finished all of her dinner. Children will recognize the mouse from the If You Give a Mouse a Cookie series. Told in a similar style, the mouse is making cookies until he forgets all about them and burns them. He isn't discouraged and makes a whole bunch more to share with his friend. This is a fun book for lovers of Chinese food and fortune cookies! The story has fortune cookies woven throughout the story as the main character, Pacy tries to figure out if fortunes really come true. Alfie wants on of his mommy's cookies more than anything but he just can't figure out how to get them. He tries lots of different ways and finally hears his mommy model the correct way to ask and realizes he forgot to say please! Robert Sabuda books are absolutely amazing. Each page is a pop up with intricate cuts and designs. It makes the most amazing three dimensional pictures. Because of the intricacy of each page, you might want to have small children read this book with adult supervision. Another adorable pigeon book by Mo Willems! In this one duckling gets a cookie just by asking politely. Pigeon goes on a rant about the things he wants and it references some of the other pigeon books. It will be a fun connection for readers of this series! A purple hippo, a crocodile and two squirrels have a big problem to solve. They have to figure out how to equally divide up three cookies between the four of them. This book is told entirely in speech bubbles just like other books by Mo Willems that children will recognize. In this twist on the gingerbread tale, Marshall and his class need to catch the gingerbread cookies that they just made that disappeared in the oven. To do that they have to solve a series of rhyming clues.